While it may not look like much, Medan Merdeka, a green square kilometre at the heart the city, is a good place to start exploring. At its centre you’ll find Jakarta’s National Monument, known as Monas, a 400ft torch, commissioned to symbolise the indomitable spirit of the Indonesian people. Take a lift to the top to experience Jakarta’s sheer vastness from above and visit the National History Museum in the building’s basement, included in the ticket price. On the west side of Medan Merdeka you’ll find the National Museum, which offers a great introduction to Indonesia and houses many impressive statues, plundered from top ruins around the country. Arguably Jakarta’s biggest highlight is its old town, Kota, to the north of the city’s modern centre. The capital’s core in Dutch colonial times, there are only very few of the attractive wooden-shuttered buildings that belie the area’s heritage left today, but the main square, Taman Fatahillah is still a hive of activity, with hundreds of carts selling street food and tourist trinkets. Try local delicious sold by the stallholders, like gado-gado (an Indonesian salad with peanut sauce), or kerak telor (an omelette fried with sticky rice, dried shrimp, and coconut). 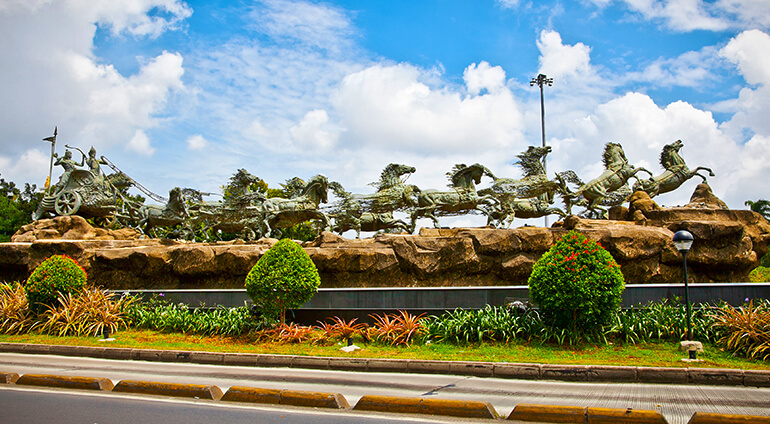 Nearby in Kota you’ll find Museum Wayang’s collection of traditional Wayang puppets and the Jakarta History Museum, which houses some interesting artefacts. Just North of Kota is the historic port of Sunda Kelapa, which was important during the Dutch empire and still have some picturesque wooden schooners and Taman Impian Jaya Ancol, a recreation complex popular with locals, featuring amusement rides and a waterpark. Take a trip eighteen kilometres from Medan Merdeka to Jakarta’s far south east to experience the extraordinary Taman Mini Indonesia Indah. This huge ‘whole country in one park’ has full-scale traditional houses from each Indonesia’s regions, as well as everything from a bird park to an IMAX cinema. If you’re keen to do some shopping there are plenty of modern malls to choose from, or head to Jakarta’s famous flea market in Menteng, where you can haggle over textiles, woodcarvings and “antiques” of questionable provenance.